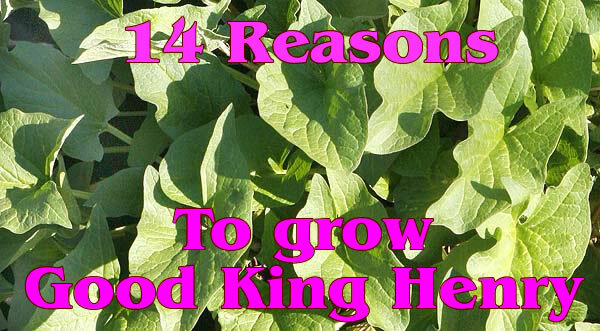 14 REASONS TO GROW GOOD KING HENRY. 2. It’s a perennial. So instead of having to keep reseeding your greens you do it once and its there forever! 3. It likes shade! Well semi shade so you can grow it under your trees and at woodland edges. 4. It looks great, it has lush foliage that makes a great ground cover. 11. Starts producing leaves and shoots in early spring. 12. Young flower buds can also be eaten. 13. Good for digestions and helps in indigestion. 14. Wildlife also like it. This can be good if you want to encourage them, or bad if you want to eat it. May need protection if wildlife is prevalent. Try growing Good King Henry yourself this year. Information on how to grow. Author Janice Hazeldine PhDPosted on April 27, 2017 Categories garden concepts, Garden work, plants, things to doTags Good King Henry, growing Chenopodium bonus-henrius, growing Good King Henry, how to grow Chenopodium bonus-henrius, how to grow Good King Henry, ideal salad plant, leafy greens to grow, salad alturnatives, vegetable plantLeave a comment on 14 REASONS TO GROW GOOD KING HENRY.